Vostochnaya Mining Company has concluded a contract with Uralmashzavod for the supply of a career excavator EKG-20, manufactured on special order. It is planned that the increased productivity excavator will arrive at the Solntsevo coal mine in December 2018. A key feature of the new excavator is the increased bucket capacity. At the request of Eastern Mining Company, it was changed from the standard 20 m3 to 22 m3. “This excavator takes into account the mining and geological conditions of the mine. 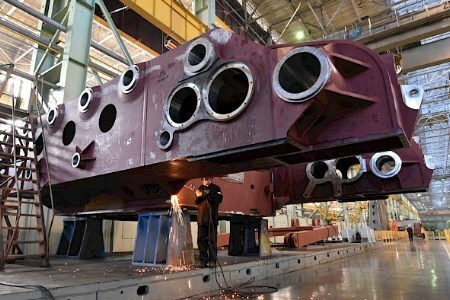 We expect that such a machine with a modified bucket design will increase excavation per cycle by 10%,” said the Director of Solntsevsky Coal Mine, Igor Kovach. Eastern Mining Company is actively modernising its production facilities. So, in 2018, the Solntsevsky coal mine opencast mine was replenished with a 22 m3 Komatsu PC4000 diesel excavator and four BelAZ 7530 dump trucks with a lifting capacity of 220 t. At the Port of Shakhtersk, two new stackers were commissioned – shiploading machines with a capacity of 1000 tph. In addition, the company is focused on improving the efficiency of business processes, including implementing a dispatching system on the main mining equipment.